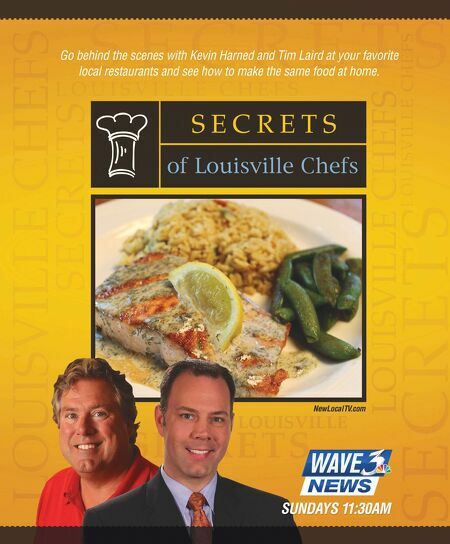 102 LOUISVILLE MAGAZINE 8.14 Mirage Mediterranean 4100 Preston Hwy. 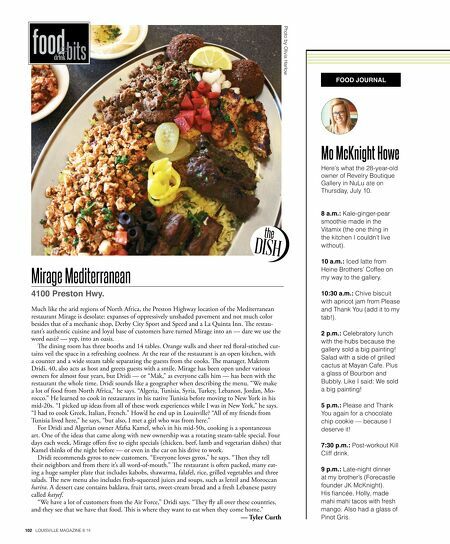 food bits drink FOOD JOURNAL the DISH Photo by Olivia Harlow Much like the arid regions of North Africa, the Preston Highway location of the Mediterranean restaurant Mirage is desolate: expanses of oppressively unshaded pavement and not much color besides that of a mechanic shop, Derby City Sport and Speed and a La Quinta Inn. Te restau- rant's authentic cuisine and loyal base of customers have turned Mirage into an — dare we use the word oasis? — yep, into an oasis. Te dining room has three booths and 14 tables. Orange walls and sheer red foral-stitched cur- tains veil the space in a refreshing coolness . At the rear of the restaurant is an open kitchen, with a counter and a wide steam table separating the guests from the cooks. Te manager, Makrem Dridi, 40, also acts as host and greets guests with a smile. Mirage has been open under various owners for almost four years, but Dridi — or "Mak," as everyone calls him — has been with the restaurant the whole time. Dridi sounds like a geographer when describing the menu. "We make a lot of food from North Africa," he says. "Algeria, Tunisia, Syria, Turkey, Lebanon, Jordan, Mo- rocco." He learned to cook in restaurants in his native Tunisia before moving to New York in his mid-20s. "I picked up ideas from all of these work experiences while I was in New York," he says. "I had to cook Greek, Italian, French." How'd he end up in Louisville? "All of my friends from Tunisia lived here," he says, "but also, I met a girl who was from here." For Dridi and Algerian owner Afafsa Kamel, who's in his mid-50s, cooking is a spontaneous art. One of the ideas that came along with new ownership was a rotating steam-table special. Four days each week, Mirage ofers fve to eight specials (chicken, beef, lamb and vegetarian dishes) that Kamel thinks of the night before — or even in the car on his drive to work. Dridi recommends gyros to new customers. "Everyone loves gyros," he says. "Ten they tell their neighbors and from there it's all word-of-mouth." Te restaurant is often packed, many eat- ing a huge sampler plate that includes kabobs, shawarma, falafel, rice, grilled vegetables and three salads. Te new menu also includes fresh-squeezed juices and soups, such as lentil and Moroccan harira. A dessert case contains baklava, fruit tarts, sweet-cream bread and a fresh Lebanese pastry called katyef. "We have a lot of customers from the Air Force," Dridi says. "Tey fy all over these countries, and they see that we have that food. Tis is where they want to eat when they come home." — Tyler Curth 8 a.m.: Kale-ginger-pear smoothie made in the Vitamix (the one thing in the kitchen I couldn't live without). 10 a.m.: Iced latte from Heine Brothers' Coffee on my way to the gallery. 10:30 a.m.: Chive biscuit with apricot jam from Please and Thank You (add it to my tab!). 2 p.m.: Celebratory lunch with the hubs because the gallery sold a big painting! Salad with a side of grilled cactus at Mayan Cafe. Plus a glass of Bourbon and Bubbly. Like I said: We sold a big painting! 5 p.m.: Please and Thank You again for a chocolate chip cookie — because I deserve it! 7:30 p.m.: Post-workout Kill Cliff drink. 9 p.m.: Late-night dinner at my brother's (Forecastle founder JK McKnight). His fancée, Holly, made mahi mahi tacos with fresh mango. Also had a glass of Pinot Gris. Mo McKnight Howe Here's what the 28-year-old owner of Revelry Boutique Gallery in NuLu ate on Thursday, July 10.